Figure 1. 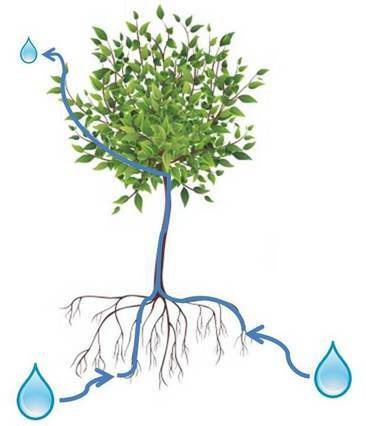 Cartoon depicting a column of water as it moves from the soil through the roots, trunk, branches, and is lost from the leaves by evapotranspiration. During the day, a substantial amount of water is lost from plants through transpiration, or the evaporation of water vapor from the surface of a plant. Water evaporating from the leaves pulls adjacent water molecules in a column up the plant through the leaf, stem, trunk and roots (Figure 1). As a result, water lost through transpiration is replaced with water taken up from the soil. A substantial pulling force (tension) is required to extract water from soil, particularly when soil is dry. Measurements of the strength of this pulling force, or tension in the water column within a plant, indicates the level of water stress in a plant. Greater tension indicates increased force required to extract water from the soil and greater plant water stress. Figure 2. Cartoon depicting a pressure chamber used to measure the water tension force in a stem or leaf (water potential). A pressure chamber measures the force needed to push water out of a hydrated leaf (a). 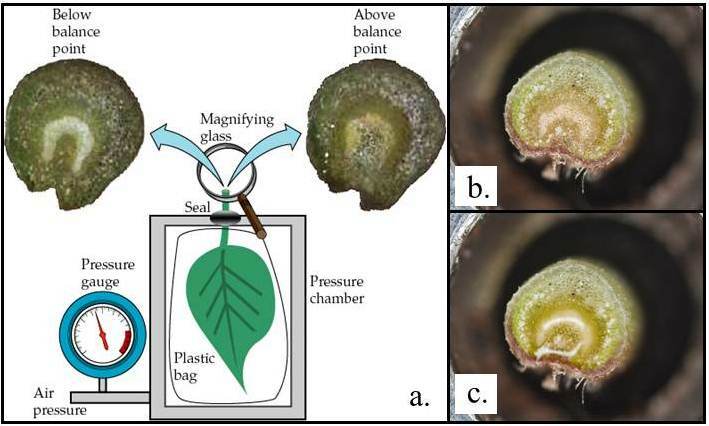 The reading on the pressure chamber when the dry petiole (b) moistens as a film of water is pushed out (c) provides an estimate of plant water potential. A pressure chamber is an instrument that can be used in the field to measure the magnitude of the pulling force required in a plant to extract water from the soil and pull it to leaves (also known as the plant "water potential"). A high pressure chamber value means that there is a lot of tension on the water in the plant, and depending on the plant species and local weather conditions, will indicate the level of plant water stress and the need for irrigation. Water potential is measured in negative pressure units, "bars" or "MPa". -10 bars equals -1MPa, or approximately 145 psi. Depending on the sampling protocol used, a pressure chamber can be used to measure the stem water potential (SWP) or leaf water potential (LWP) of a plant. If the sampled leaf comes from a shaded lower part of the canopy, near the trunk or a main scaffold or cordon, and has been covered for 10 minutes or more, then the tension in the sampled leaf is the same as the tension in the stem (SWP). If the sampled leaf is actively transpiring (but covered at the moment of sampling to prevent dessication! ), then you are measuring LWP. The most useful time to sample water potential for the purpose of irrigation scheduling is at midday (1:00 – 3:00), when the level of tension is typically at its maximum for the day. The Fruit and Nut Research and Information Center website contains instructions on measuring water potential with a pressure chamber.